In a nation all too accustomed to outbreaks of drug related violence, it takes a truly horrific incident to shock the entire population. The murder of 52 people in a casino set ablaze in the northern city of Monterrey last week did just that. Five suspects have since been arrested in a crime that President Felipe Calderon described as an “abhorrent act of terror and barbarism.” In Guadalajara, half of the city’s casinos have been shut down, while Sunday’s Mariachi Festival parade was overshadowed by protests against the government’s security policy. Nuevo Leon Governor Rodrigo Medina confirmed Monday that five men have been arrested, while two others are still being sought in connection with the deadly arson attack. Medina told Mexican television that the suspects, believed to belong to the Zetas drug cartel, had confessed to involvement in the attack. The armed men reportedly burst into the Casino Royale shortly after 3 p.m. on Thursday and doused the establishment with flammable liquid. Some reports suggest they ordered those inside to leave before setting it ablaze, but many panicked and fled further into the casino where they became trapped and, with the emergency exits apparently locked, perished in the fire. The consequences of the attack have been felt across the nation. Following a review of security measures in the wake of the tragedy, six casinos were closed in Guadalajara and Zapopan this weekend. These casinos comprised half of Guadalajara’s ten gambling establishments: the Capri, the GDL, El Gran Nevada, the Twin Lions, and Yak; along with the 777 in Zapopan (Avenida Patria and Vallarta). Speaking after the inaugural parade of Guadalajara’s International Mariachi Festival on Sunday, Guadalajara city hall’s legal officer Roberto Lopez Lara said he understood the inconvenience to the business owners affected, but stressed security was more important. Lopez confirmed surveillance operations will continue indefinitely and that the casinos will not reopen until they comply with municipal safety regulations. Lopez was not the only one to speak out after the parade. 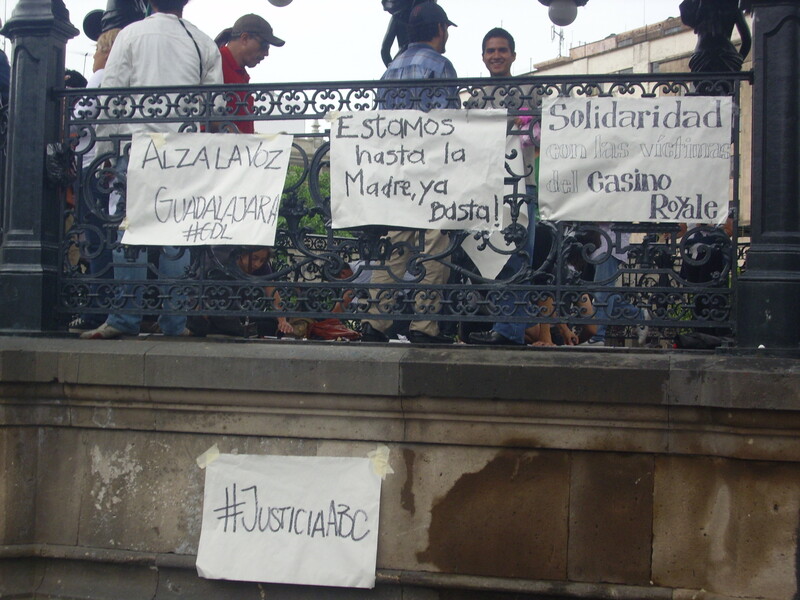 Following the event around 100 people congregated in Guadalajara’s Plaza de Armas to condemn the insecurity that plagues Mexico and to show solidarity not only with the victims in Monterrey, but all those who have suffered in the drug wars that have claimed over 40,000 lives since Calderon took office in 2006. Organizers hung placards on the plaza’s bandstand: “Stay strong Monterrey,” “I want my country back” and “We’ve had it up to here, enough” read some of the messages. The demonstration drew a number of sympathizers and curious onlookers who had attended the parade. They were encouraged to write messages of solidarity, remember the victims and express their dissatisfaction with the government. 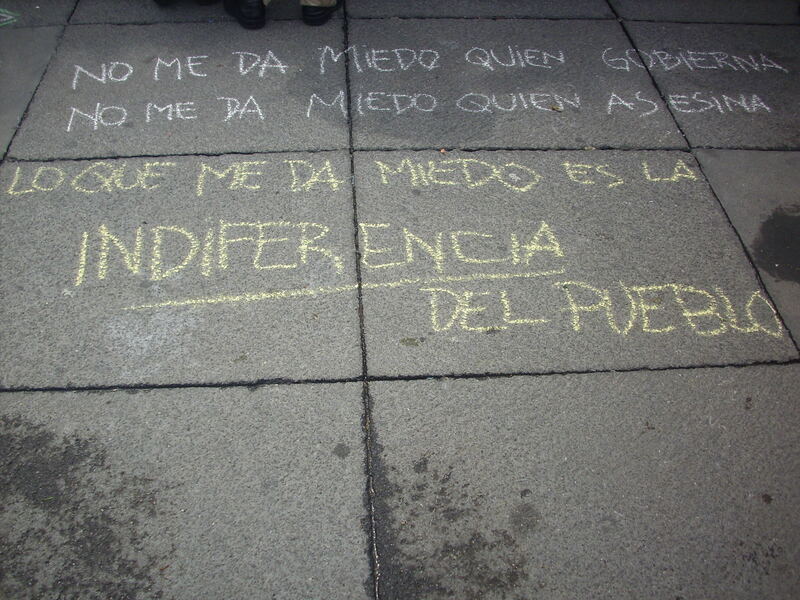 “The government does not scare me, the assassins do not scare me, what scares me is the indifference of the people,” read one message. But most of the anger was directed toward Mexico’s politicians. “We are citizens with no party affiliation, we are tired of politicians who say they want to end this war but then throw more police on the streets … They want to militarize our country more,” said Claudia Ocampo, one of the organizers. The protesters also criticized the decision to go ahead with the parade despite the three days of national mourning that had been announced after the attack. “We find it disrespectful that during these days of mourning, the authorities continue as if nothing has happened,” said Ocampo. Another of the organizers, Isaac Cardenas, made a series of demands to the authorities, including the resignation of “inept politicians,” the conviction of criminal groups who have shown no mercy toward civil society, and the retraction of the restrictions on individual freedoms and human rights proposed in the National Security Act. President Calderon has been trying to push the controversial National Security Act through Congress in the wake of the tragedy in Monterrey. The new law, which has met general congressional approval but the specifics of which require greater discussion, would grant the executive branch and the military far greater power in their prosecution of the war on organized crime. Five men who have been arrested in connection with the murder of 52 people in Monterrery’s Casino Royale last week told investigators they did not plan to kill anyone and “only wanted to scare” the casino owners. The suspects, who federal investigators say admitted responsibility for the attack, said the tragic loss of life was the result of a botched operation to intimidate the owners of the establishment. The original plan was to evacuate the casino before setting it alight, but many of those inside fled further into the building and the fire quickly grew out of control. The suspects, four of whom are native to Monterrey and the other is from Chihuahua, are believed to have been working for the notorious Zetas cartel. They claimed to have been subsequently “scolded” by their bosses for causing so many deaths. The authorities are now seeking seven more suspects in connection with the attack.